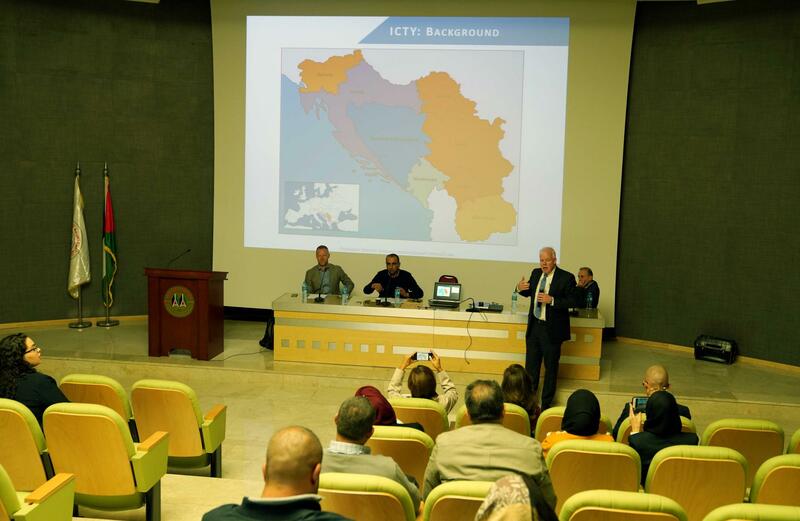 Policy and Conflict Resolution Studies Center the Arab American University held a lecture entitled "Palestine in the International Criminal Court between Theory and Practice" at Ramallah campus, targeting law students and master students in conflict resolution program. Where the university hosted two international experts in criminal law Professor Dermot Grom and Professor Max Dolissis. The lecture was attended by Dr. Ayman Yousef Chairman of Policy and Conflict Resolution Studies Center, along with Dr. Rizk Samoudi lecturer in Law at Arab American University, Dean of the Faculty of Law from AL- Najah University Dr. Muayad Hattab, and a number of law students at Arab American Universities, A number of faculty members, and a number of lawyers and specialists in criminal and humanitarian law. The lecture was opened by the Chairman of Policies and Conflict Resolution Studies Center Dr. Youssef he welcomed the attendance. As he assured the importance of the lecture, which aims at introducing students to international criminal law and familiarizing with international decisions of the Criminal Court, whereas experts will also present their practical experience in International Criminal Court. In turn, the lecturer at the Faculty of Law at the Arab American University Dr. Rizk Samoudi who moderated the session said that “That the majority of Palestinians believe that the International Criminal Court is the savior of the Israeli occupation crimes against the Palestinian people, and Ask what degree is this conviction true?” expressing that the experts in international criminal law will answer this question. 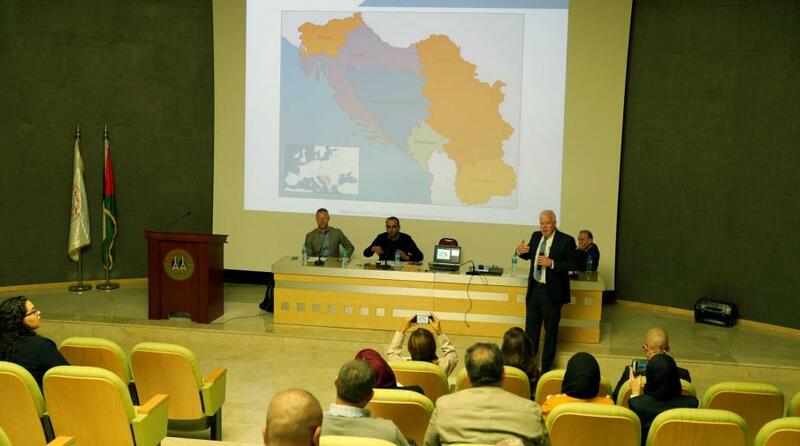 The Dean of the Faculty of Law at An-Najah University Dr. Muayad Hattab explained that the Palestinians need to know what is happening in the agendas of the International Criminal Court in light of their calls to go to the court. As he called advised students to take advantage of the lecture for its importance and thanked the university for holding this lecture. Professor Dermot Grom filed several cases at the International Criminal Court in Hague, spoke about his experience in the case of the former Yugoslavia and brought cases against the leaders of the Serbian army of their crimes in Bosnia and Herzegovina. As he pointed the difficulties and challenges faced in that case, mentioning the importance of collecting evidence and documents that can contribute to the charges against the perpetrators of the crimes, among them documents published in the media statements of officials and photographs of victims, stressing the importance of the presentation of eyewitnesses and victims. He summarized his speech say that the lawyer who raises cases in the International Criminal Court finds it very difficult to collect information, assuring the need to prepare very well for the case, and stressed the importance of preparing documents, evidence and witnesses to achieve success. The Professor Max Dolissis, a lawyer from South Africa and expert in international criminal law who has written many books on humanitarian law. He spoked about his experience when he filed the case of crimes that happened in Rwanda 1994, noting that the ICC faces many criticisms for many reasons such as their slow work, where some accused it for politicizing ans is only interested in Africa affairs and issues without attention to other cases such as crimes committed in Afghanistan by the US military, for example.